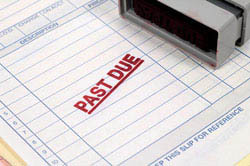 A bill that is not paid by the “Due Date” stated on the bill (typically twenty days after the bill is mailed) the account is considered to be in arrears. An account deemed to be in arrears will be assessed a “Billing Arrears” charge, as listed in the co-op rate sheet. The charge will be applied to the unpaid balance. If the bill remains unpaid for six weeks, a “Disconnect Notification” will be delivered to the customer’s residence. An amount (per current rate sheet.) will be added to the customer's account to cover costs. If the member’s or customer’s gas bill is not paid within fourteen (14) days of the issuance of a “Disconnect Notification”, a serviceman will be dispatched to "lock off" the natural gas service. Delivery of Natural Gas will not be resumed until the bill is paid in full including all applicable charges.